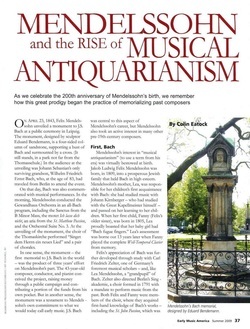 This article originally appeared in the Summer 2009 issue of Early Music America magazine. On April 23, 1843, Felix Mendelssohn unveiled a monument to J.S. Bach at a public ceremony in Leipzig. The monument, designed by the sculptor Eduard Bendemann is a four-sided column of sandstone, supporting a bust of Bach, and surmounted by a cross. (It still stands, in a park not far from the Thomasschule.) In the audience for the unveiling was Johann Sebastian’s only surviving grandson, Wilhelm Friedrich Ernst Bach, who, at the age of 83, had traveled from Berlin to attend the event.On that day, Bach was also commemorated with musical performances. In the morning, Mendelssohn conducted the Gewandhaus Orchestra in an all-Bach program, including the Sanctus from the B Minor Mass, the motet Ich lasse dich nicht, an aria from the St. Matthew Passion and the Orchestral Suite No. 3. At the unveiling, the choir of the Thomaskirche performed “Singet den Herrn ein neues Lied” and a pair of chorales. In one sense, the Bach monument – the first memorial to J.S. Bach in the world – was the product of three years’ effort on Mendelssohn’s part. The 43-year-old composer, conductor and pianist conceived the project, raising money through a public campaign, and contributing a portion of the funds from his own pocket. But in another sense, the monument was a testament to Mendelssohn’s lifelong commitment to what we would today call Early Music. J.S. Bach was central to this aspect of Mendelssohn’s career, but he also took an active interest in many other pre-19th-century composers. Felix’s appreciation of Bach was further developed through study with Carl Friedrich Zelter, one of Germany’s foremost musical scholars – and, like Lea Mendelssohn, a “grandpupil” of Bach. Zelter also directed Berlin’s Singakademie, a choir formed in 1791 with a mandate to perform music from the past. Both Felix and Fanny were members of the choir, where they acquired first-hand knowledge of Bach’s works – including the St. John Passion, which was given in the 1822-23 season. Mendelssohn's studies with Zelter and participation in the Singakademie culminated in an event that’s often considered seminal to the Early Music Movement. When Felix received a copy of Bach’s St. Matthew Passion from his grandmother in 1823, the young composer was awestruck by the monumental work. By 1827 Mendelssohn was organizing private readings of individual movements with a small choir. In 1828 his fascination with Bach’s setting of St. Matthew turned into a grand ambition when – together with a friend, the singer-actor Eduard Devrient – he devised a plan to perform it. Resolved to win Zelter over to their scheme, the pair paid a formal visit to the distinguished conductor-scholar, to seek permission to borrow his choir for the project. Devrient replied that “youth was the time to grapple with difficulties” – and that it would reflect well on Zelter if two of his pupils successfully presented the St. Matthew Passion. As well, Mendelssohn explained that he had already worked out an efficient way to organize the rehearsals. Zelter at last agreed to support the project – while reminding the young men that if the choir members didn’t like the idea, they would simply stop coming to rehearsals. By today’s standards, however, this St. Matthew Passion would scarcely be considered authentic, or even very historically informed. Mendelssohn conducted his vocal and instrumental forces with a baton, seated at a piano (not a harpsichord), on which he played continuo parts. From this position he led 158 choristers – a much larger force than the eight-to-sixteen singers Bach is thought to have had at his disposal. Moreover, about 20 movements were cut, including ten arias, four recitatives and six chorales. Nevertheless, Mendelssohn's presentation of the St. Matthew Passion was one of those rare events that seem to have a galvanizing effect on musical history. The work was so well received that it was repeated by popular demand ten days later, led by Zelter. Within a few years, the St. Matthew Passion was heard in Frankfurt, Breslau, Stettin, Königsberg, Cassel and Dresden. The 1829 Berlin revival of the St. Matthew Passion also had the effect of firmly connecting Mendelssohn’s name with Bach. And throughout the remaining 18 years of his short life, he continued to popularize Bach’s music. As with the St. Matthew Passion, not all of his efforts would impress Early Music specialists today as “period performances” – unless the period in question is the mid-19th century. For example, in 1840 Mendelssohn accompanied the violinist Ferdinand David in two unaccompanied works – the Prelude from the Partita in E Major and the Chaconne from the Partita in D Minor – with a piano part that he himself had composed. When visiting England, Mendelssohn played Bach on the organ of St. Paul’s Cathedral, and in a few other churches that had instruments equal to the task. (Most English organs did not yet have full C-compass pedal-boards – but with the introduction of Bach’s music this soon changed.) And on one trip to London, in 1844, he conducted the Philharmonic Society in the English premiere of the Orchestral Suite No. 3. Also in 1844, at the request of an English publisher, he edited four volumes of little-known organ music by Bach: variations on the chorales Christ, der du bist der helle Tag and Sei gegrüset Jesu gütig; 15 choral preludes from BWV 651-668; and 44 preludes from the Orgel-Büchlein BWV 599-644. 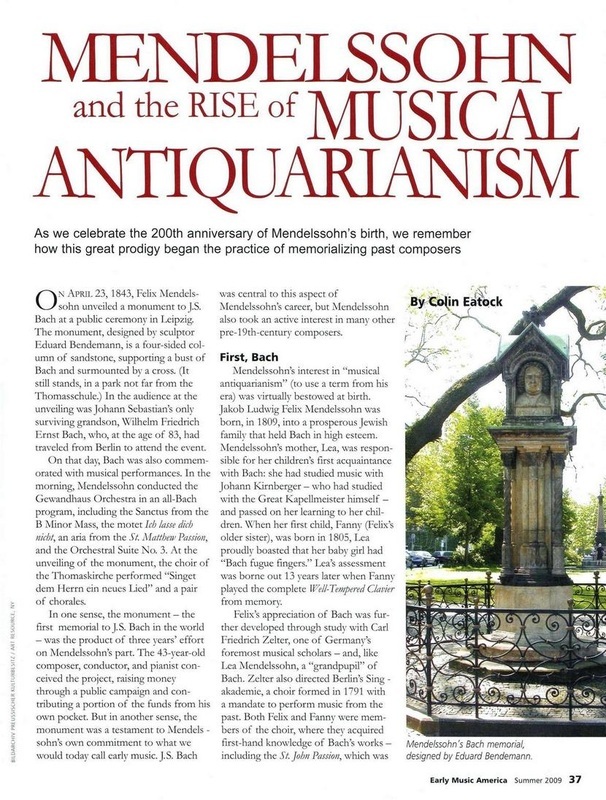 However, Mendelssohn’s voracious appetite for music from past eras was by no means limited to Bach. In 1831, during a stay in Rome, he was fascinated by the Papal Choir’s performance of Allegri’s Miserere. (This was the work that Mozart famously copied out from memory in 1770; similarly, Mendelssohn wrote out some passages.) In Rome he also befriended the Palestrina scholar Giuseppe Bainini, who allowed Mendelssohn to peruse an immense library of more than 1,000 scores by Renaissance and Baroque masters. Three years later, when Mendelssohn was municipal music director for the city of Düsseldorf (his first professional appointment as a conductor), he scoured church archives throughout the Rhineland for old scores. Among his finds were long-forgotten copies of Lasso’s Popule meus and Palestrina’s setting of the Seven Last Words of Christ – both of which he conducted in Düsseldorf. Furthermore, Mendelssohn cultivated a lifelong devotion to Handel. His first efforts to edit a Handel score – Acis and Galatea, for performance by Berlin’s Singakademie – took place in 1828. (According to Mendelssohn biographer R. Larry Todd, this task was undertaken as part of the deal with Zelter to secure permission to perform the St. Matthew Passion.) The following year, during his first trip to England, he visited the Royal Music Library, where he took a particular interest in Handel’s scores, and made a copy of Dixit Dominus for Zelter. Mendelssohn promoted the music of Handel throughout Germany, much as he helped to make Bach better known in England. He conducted Act II of Israel in Egypt in Düsseldorf in 1833 – and the complete work three years later in Leipzig, substituting an organ continuo for the wind instruments commonly used at the time. As well, he presented Solomon in Cologne in 1835, excerpts from Messiah in Berlin in 1843, and Alexander’s Feast in Aachen in 1846. At the request of the Handel Society, in 1844 Mendelssohn prepared a new edition of Israel in Egypt. What the London-based society wanted was a modern performing edition, complete with articulations, dynamics, metronome markings, and a written-out continuo part for organ or piano. However, Mendelssohn took a very different approach, producing something akin to an Urtext edition: a full score that was as faithful to Handel’s original as possible, with his editorial suggestions appearing only in his keyboard reduction. For two years he and the Handelians were at loggerheads over the final form of the edition. Eventually Mendelssohn prevailed, and the society published it as he wished. Perhaps the most systematic effort that Mendelssohn made to revive music from past eras was the presentation of Historical Concerts at the Gewandhaus in Leipzig. The first such concert, on February 15, 1838, consisted of Bach’s Orchestral Suite No. 3, and his Violin Sonata No. 3 (played by Ferdinand David); Handel’s Zadok the Priest (sung in German); selections from Gluck’s Iphegenie in Aulis; and finally a violin concerto by Viotti. Subsequent programs in the chronologically organized concerts featured works by such composers as Cimarosa, Haydn, Mozart, Salieri, Méhul, Weber, and finally Beethoven. Similar series were presented in 1841 and 1847. Handel’s influence on Mendelssohn is apparent in the Te Deum he wrote for Berlin’s Singakademie. The first movement is a glorious display Handelian counterpoint, as is the final, triumphant, chorus. Similar use of Handel’s “trumpet and drum” style can be heard in Mendelssohn’s Magnificat, and in a Gloria he wrote when he was just 13 years old. And there’s a wonderful “Zadok moment” in the opening chorus of St. Paul (“Herr, Der du bist der Gott”): the orchestra crescendos on arpeggiated chords that lead up to a big choral entry. Furthermore, a few of Mendelssohn’s works hearken back to earlier musical periods. Portions of his Six Anthems Op. 79 and the German Liturgy owe a debt to Renaissance polyphony; and the first of the Three Motets Op. 69 is decidedly Palestrinian in style. Not everyone in mid-19th century Europe shared Mendelssohn’s fondness for music from bygone eras. Hector Berlioz’s snide remark that “Mendelssohn loves the dead a little too much,” neatly encapsulated a strain of Romantic thought that viewed history as so much cumbersome cultural baggage. Richard Wagner took this point of criticism even further, arguing in his scurrilous essay Das Judenthum in der Musik of 1850, that Mendelssohn was drawn to the music of the past because he lacked the capacity for original thought. For his promotion of Early Music, Mendelssohn is sometimes given too much credit. He did not “found” the Bach Revival: it can be traced back to Zelter, and a few others who kept the faith, such as Van Swieten in Vienna. As well, an aura of inevitability surrounds many of Mendelssohn’s antiquarian activities. If, for instance, he did not conduct the St. Matthew Passion in 1829, it’s likely that someone else would have, before long. Yet Mendelssohn’s efforts to foster interest in the music of previous centuries was one of the driving forces behind the development of the Early Music movement. His contributions raised awareness and spurred interest in the music of the past.